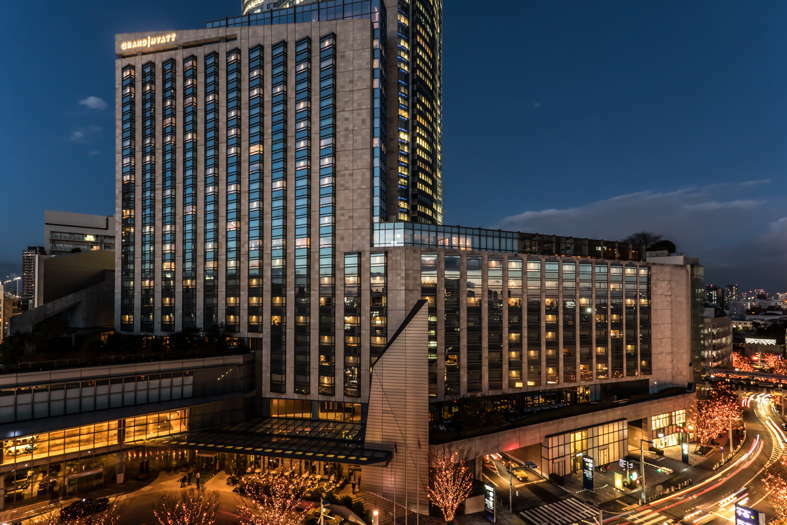 The Grand Hyatt Tokyo is a luxury lifestyle hotel that won’t destroy your wallet in the way its sister properties at Park Hyatt and Andaz will. 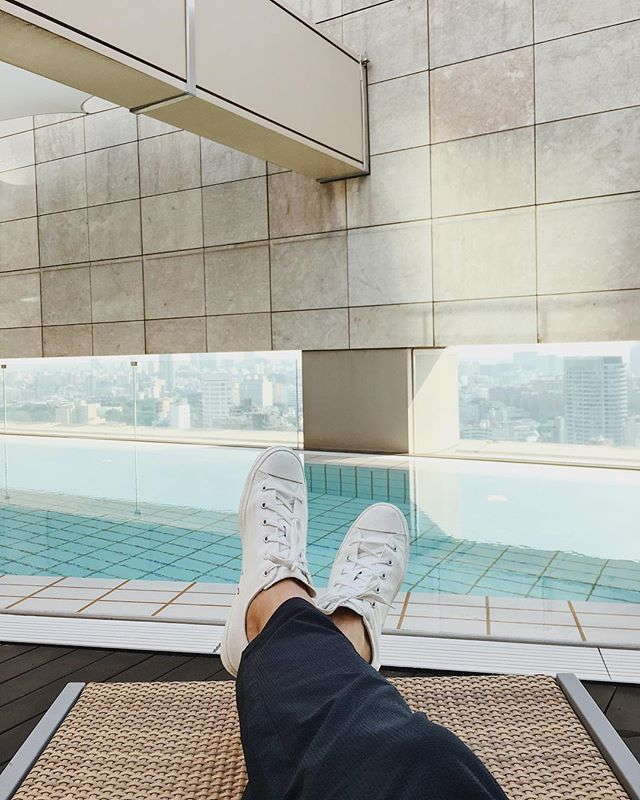 The modern, high-design spot is part of the Roppongi Hills complex that has over 200 shops and restaurants and has made the neighborhood a hot destination for shopping, eating, and drinking. Inside the hotel there are numerous amenities with stellar restaurants, fun bars, a great spa, and more. If you’re a fan of Hyatt and want a centrally located stay, you’ll love this iteration of the global brand. Bedrooms have earthy tones and muted designs. Generally speaking, they’re huge and the king-sized beds seem wider than normal. Rooms have incredible views, and all come with Nespresso coffee machines, free water, and tea. Paying extra for club level rooms is worth your while. The sizable spot provides free breakfast, along with other meal services throughout the day. From 5:30 to 7:30 p.m. you can get free booze and canapes. Lastly, access to the entire spa area is free with club level rooms. Bathrooms have light wood floors, Toto automated toilets, large showers, and separate sunken tubs. Bath products are by June Jacobs and there are tons of complimentary toiletries in case you left anything at home. The spacious lobby has a bevy of lounge seating and it’s not uncommon to see guests holing up to work or relax while looking out the large windows. You’ll find beautiful art pieces throughout the hotel, none more so than in the lobby that has the feel of an ever-changing gallery. The stunning indoor lap pool is bathed in red granite and has a bit of a grotto vibe as you descend a flight of stairs into the entire spa area. A brightly lit hot tub hugs one side of the pool between marble columns. YOU SHOULD KNOW While the pool and gym are free to use, the locker rooms are not. Nagomi Spa is a dark and peaceful enclave by the pool. There are a number of treatment rooms where guests can get massages, facials, wraps, and more. Inside the spa’s locker room, you’ll discover electric massage chairs and large onsen-style baths – both hot and cold. The gym has hardwood floors and personal trainers on hand to assist with workouts. There are TechnoGym machines, free weights, and complimentary headphones as well. If you forgot your workout gear, the hotel will rent some to you for a fee. 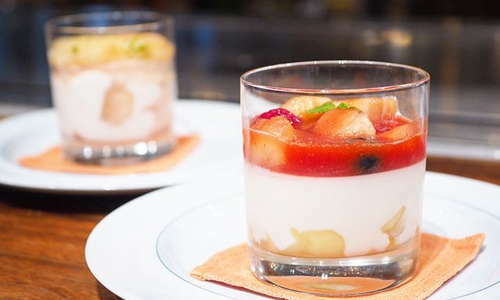 Seven different restaurants serve a range of cuisine from French and Italian to Chinese and Japanese. 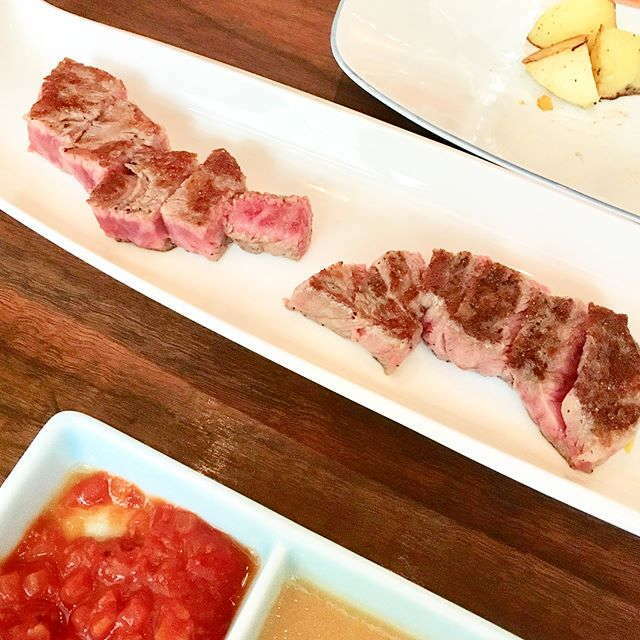 If you’re a teppanyaki fan (and no, we’re not talking about Benihana), head to Keyakizaka on the 6th floor where the chefs prepare masterful wagyu meats and pair them with sumptuous sake. 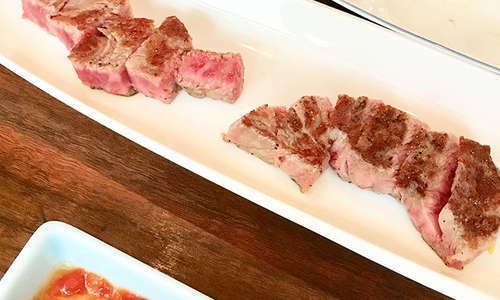 The beef at Keyakizaka is special The hotel has their own brand of wagyu beef that they’ve developed with a special superfood feed that gives their cattle a distinct flavor you can’t find anywhere else. Three different bars offer three distinctly different drinking experiences. At Maduro, you’ll get live jazz, rare whiskey, and stellar cigars. At The French Kitchen Bar, a sommelier will enlighten you with wine. And at The Oak Door Bar, you’ll discover a chicly designed spot with unique craft cocktails. The hotel is inside Roppongi Hills, a giant complex with shopping, restaurants, bars, and cinemas. 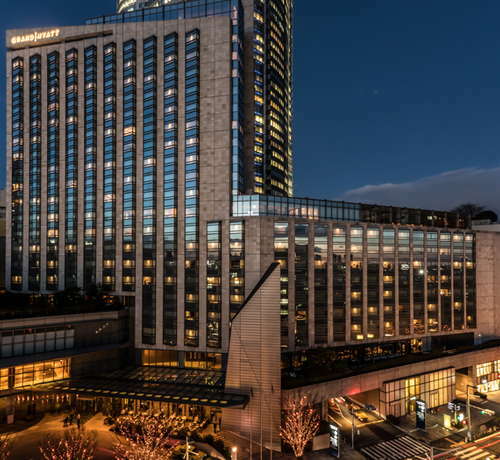 Around the hotel, Roppongi is known for its great nightlife and restaurant scene, and it’s all walkable. Attached to the complex is the Roppongi Subway Station which makes it easy to get everywhere in the city. Inside Roppongi Hills is L’Atelier de Joël Robuchon (2-minute walk) a two-Michelin star French restaurant with a worthy reputation. Just outside the hotel is Joumon Roppongi (4-minute walk), a claustrophobic yakitori joint with perfectly skewered meats. The nightlife in Roppongi is always fun and there are great bars to sample nearby. If you’re a fan of the Beatles, head to Abbey Road (7-minute walk), where you’ll get tribute bands singing the fab four’s favorites. For a wilder night, check out Geronimo Shot Bar (7-minute walk), a fairly politically incorrect dive with great drink deals. The Grand Hyatt is a luxury hotel that focuses on its guests in a non-stuffy way. 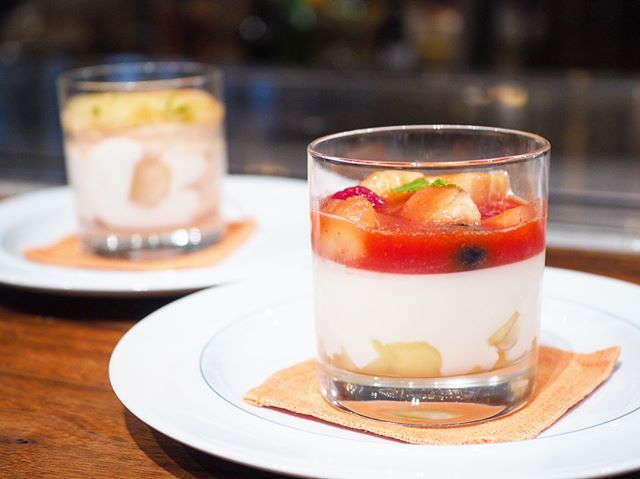 Considered a lifestyle spot, the hotel lives up to that rep with great restaurants and bars and a commitment to help guests make the most of their stay in Roppongi. The hotel is also considerably convenient, it’s connected to the subway and is walking distance to superb shopping, drinking, and eating destinations. All in all, the Grand Hyatt is a solid luxury option without the exorbitant luxury price (though it’s still not cheap).